NBA media members will soon vote on end of the season awards, and since the value of many contracts hinge upon certain awards—particularly being named to the All-NBA team—they will be deciding upon whether certain players will earn millions of extra dollars or not. It is strange enough that media members are deciding this, but even stranger that team employees or team-affiliated employees—broadcasters, writers for team websites—are included in this pool, presenting legitimate ethical dilemmas on top of their votes. Not any longer. This afternoon, two broadcasters employed by NBA teams (the Bulls and Pacers) announced that they had lost their votes, and that team-employed broadcasters wouldn’t allowed to vote this year. Last year, the biggest dilemma was whether to name Anthony Davis to the All-NBA Third Team; under the so-called “Derrick Rose Rule,” doing so would’ve bumped his salary up to 30 percent of the salary cap, instead of 25 percent, giving him an extra $24 million, and costing the Pelicans some precious salary cap space. He didn’t make it. But as ESPN’s Brian Windhorst noted this morning, in addition to the Derrick Rose Rule, a rule in the newly signed Collective Bargaining Agreement allows older players who make an All-NBA teams to be re-signed for crazy amounts of money. If a player is voted to the All-NBA team and has eight or nine years of experience, then he qualifies for a special exception to sign a massive contract with his team for about $75 million more than any other team can pay him. A player also qualifies if he wins MVP or Defensive Player of the Year. But in that case, the player would probably already be on the All-NBA team. It doesn’t apply to many players. But the ones it does apply to could have a big impact on the league. 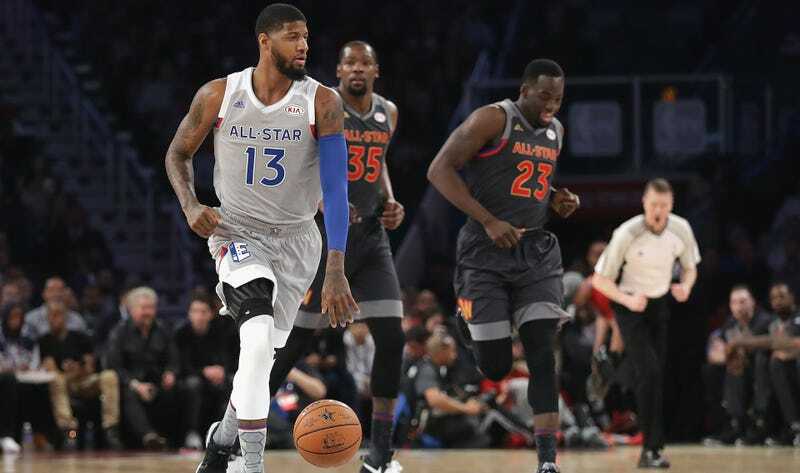 This year, for example, if either Paul George or Gordon Hayward makes one of the three All-NBA teams, that would give his team an overwhelming advantage in re-signing him long-term. This voting cull might not materially affect the outcome of any awards this year, but removing team employees from a pool of voters who could determine the salaries of star players is a useful step in making the awards more ethically rigorous. Pacers radio guy Mark Boyle first announced the news and he would have been in one of the toughest spots. Paul George needs to make an All-NBA team to earn a potential pay bump, and he’s publicly lobbying for a spot. Since voting is public, Boyle risks either looking like a homer for voting for George, or alienating George if he votes against him. It’s a no-win situation, and while awards voting can never truly be objective, this at least makes it more independent.